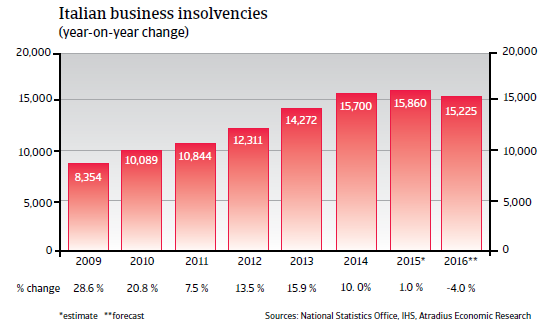 In line with Italy´s weak economic performance over the past years, corporate insolvencies have registered annual increases since 2008, up to nearly 16,000 cases in 2015. 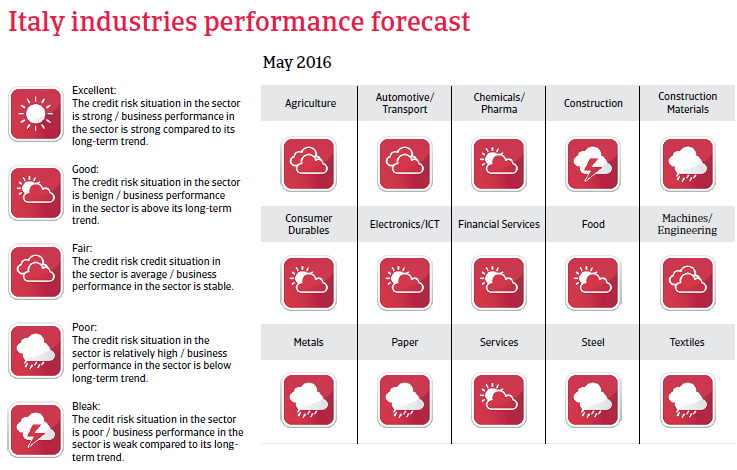 In 2016 a slight decrease is expected, in line with a modest economic rebound. Liquidity problems of Italian businesses are exacerbated by continuing poor payment behaviour, especially by the public sector. Moreover, Italian companies compared to their Western European counterparts, show a higher average gearing – especially short-term gearing. Many businesses suffer from the still restrictive loan policies of many banks. After yearly contractions recorded in the years 2012-2014, the Italian economy experienced a modest rebound of 0.6% in 2015. 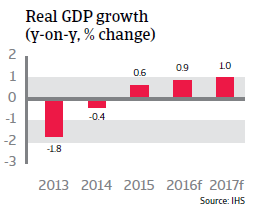 In 2016 GDP is expected to increase 0.9%. Domestic demand is expected to stabilise further in 2016 as investments slowly pick up and growth in household consumption accelerates to a forecast 1.1%. However, despite a decrease in 2015, this year the unemployment level is forecast to remain stubbornly high, at 10.9%. 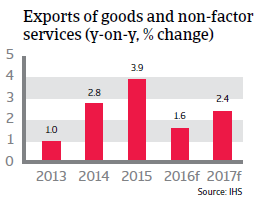 Export growth is expected to slow down in 2016. 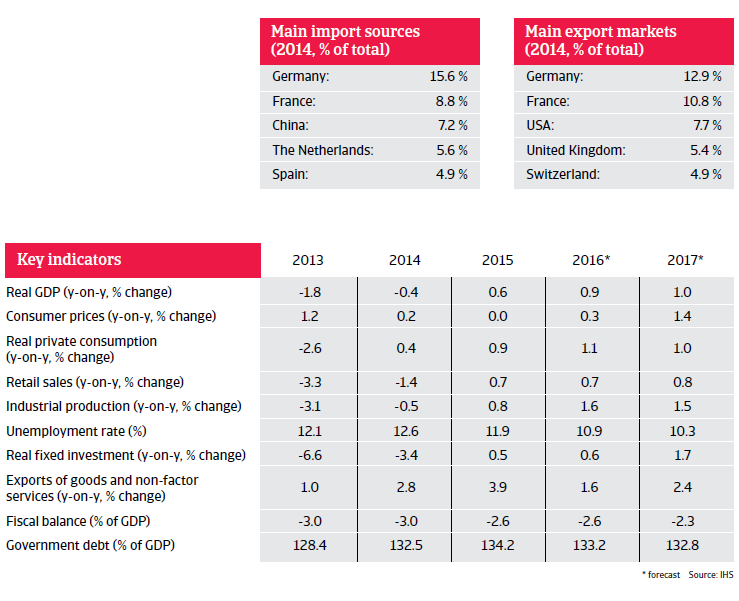 Italy has lost nearly 20% of its share in its export markets over the last couple of years – particularly in 3.European markets. That said, Italy’s productivity is expected to recover further. The Italian banking sector remains under pressure, and, in particular, loan provisions to smaller businesses remain constrained. Despite some efforts for fiscal consolidation, the government debt-to-GDP ratio remains high, at more than 130%. In order to decrease the debt ratio substantially a nominal annual growth rate of 3% would be required.